I've been really excited while doing re-exams lately. I'm nerdy if you hadn't noticed and I get so giddy seeing how much posture can change over such a short amount of time. What I found out is that many people don't usually know what the excitement is all about. I wanted to take a quick moment to show you with some pictures what it means when you look at your posture in the mirror and its greater effect on your health. The best place to start would be to see what NORMAL looks like. 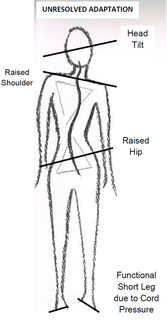 When you look in the mirror, NORMAL posture is seeing your ears, shoulders, and hips level. This means that the body is in good posture and there is limited interference in normal body function. So what happens when you look in the mirror and that's not what you see? If you see that your glasses or sunglasses are a little crooked on your face or that your shoulders aren't level, or even notice that your pants sit unevenly on your hips, you could be experiencing UNRESOLVED ADAPTION..
What is UNRESOLVED ADAPTATION and why is it important? If you're experiencing UNRESOLVED ADAPTATION, also known as poor postur, then at some point in your life you've probably experienced a slip, fall, or injury OR chronic poor posture from school or work. This then caused the atlas, the tiny little bone at the top of your neck, to move slightly out of place. When this happens your head will also tilt a little out of place. Here is the cool part... your brain is so smart it's not going to let you walking around looking at the world all crooked! It then tips your head back just enough so that your eyes come back to level. Because of the small misalignment of the atlas, your body will then try to shift all the way down and adapt to the little bone being out of place. Why does this matter to your health? In the short term, everything shifting in your body will cause the muscles to get sore and spasm causing neck, back, and shoulder pain that will potentially make it all the way down into the hips, knees, and ankles. In the long term, when the atlas is out of place, even just a tiny bit, the messaging from your brain to your organs starts to become interrupted. This means bad messaging to your heart, pancreas, lungs, all your organs. Over a long period of time, this chronic bad messaging may show up as chronic health problems: high blood pressure, diabetes, asthma... all because your body stopped adapting and getting the correct messages from your brain! Next time you look in the mirror, what is YOUR posture telling you? You may not be experiencing any physiological symptoms yet, but having poor posture is an early indicator of problems in your health to come. If you feel it's time for a change, let's work together to change the man in the mirror for lasting results in 2017. Not only will it be good for your health, but you'll find yourself with more energy and focus to do the things you love! I'd love to connect with you! Do you catch yourself frequently in a hunched over position at home or work that leads to neck and shoulder pain and tightness? This video is for you! Thank you! You will receive an email confirmation to your inbox to confirm the request shortly. Located in the Atrium Offices. Free parking on the street or under/below the building in the Unreserved Spaces.